Home > Services > A total knee replacement is a surgical procedure whereby the diseased knee joint is replaced with artificial material. The knee is a hinge joint which provides motion at the point where the thigh meets the lower leg. The thighbone (or femur) abuts the large bone of the lower leg (tibia) at the knee joint. During a total knee replacement, the end of the femur bone is removed and replaced with a metal shell. The end of the lower leg bone (tibia) is also removed and replaced with a channeled plastic piece with a metal stem. Depending on the condition of the kneecap portion of the knee joint, a plastic "button" may also be added under the kneecap surface. 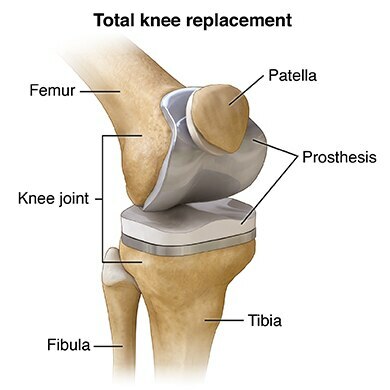 The artificial components of a total knee replacement are referred to as the prosthesis.